Now is the time to sign up for our 2019 Main Season Share! 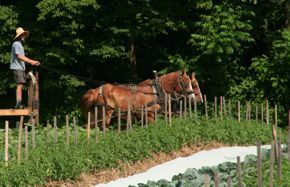 We are a horse-powered vegetable farm in Conway, Massachusetts. We run a CSA (Community Supported Agriculture), which means that we offer fresh produce for weekly pickup on the farm to members who prepay for each session. Members are provided with a cloth bag to fill with their own selection of vegetables from the day's harvest. From our farm shop they can also purchase other local products, such as bread, cheese, fruits, yoghurt, honey, maple syrup, miso, pickles & krauts, kombucha, dressings, and various other goods. Our main season generally runs for 22 weeks, from the first full week of June through the end of October. Pickup days are Tuesdays and Fridays from 3:00-6:30pm. Please see the "CSA Sign-Up" page for more details. We now also offer part-time share options for folks who are away a lot or need smaller quantities of vegetables than what the regular share provides. We are open to the public during CSA distributions for non-members to come and shop as well. We now offer a Winter Share option as well, with an initial distribution of a few crops for you to store in your own home, plus the bulk of the share available in ten bi-weekly distributions at the farm. More details are on the Winter Share page. Our farm is graced by the South River, which separates the growing fields and our home and barnyard from the roadside area where the CSA distribution barn is located. 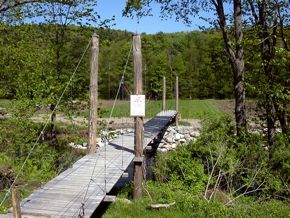 We cross over either by going through the river via horse and wagon or over it by foot, on a wooden suspension bridge. Our CSA families often spend hours at the farm when they come for their weekly vegetables, wading in the river, picking you-pick crops in the fields, and visiting with friends. It is with a reverence for all living things that we aim to raise every plant and animal on the farm in optimal health and vitality. To this end, we begin by nourishing the land with compost and animal manures, mineral amendments, inoculants, green-manure crops and grazing animals. 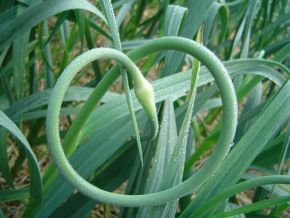 By enlivening the earth in this manner, the food and forage harvested tend to yield an enlivening effect of their own. It is this quality in our produce that you can taste and feel. In light of the belief that food is our best medicine, it is our ultimate hope that by offering this “medicinal” food we are contributing to the healing and enlivening of our culture.